We are seafood lovers in my family and anything that has to to do with seafood it just takes me back to when I was a kid. My father's refrigerator always had all kinds of seafood fish, lobsters, clams you name it we had it ! This is a recipe that I came up with and as much as I make there's never any leftovers !! No story attached to this one, i t's just simple, fast and tastes delicious !! 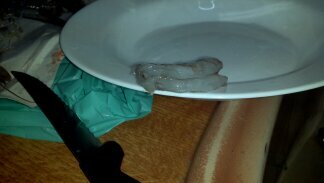 Shrimp must be thoroughly cleaned. Take off the shell and head then with a knife cut in the center of its back and take out the intestine. Some people cook it with the shell and head but you get all dirty when you are eating so you will not enjoy it as much. That's just my opinion. 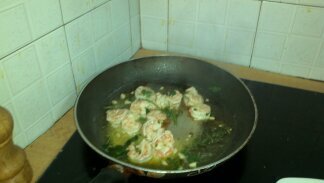 Once you have cleaned all your shrimp, add garlic, oil and to your pan. 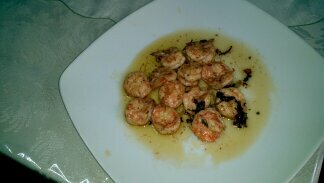 You saute your shrimp until they turn red. You should saute for about 15 minutes. 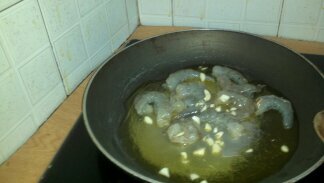 Then you add your vinegar and then squeeze your lemon saute for about 5 minutes. Add your parsley saute for another 3 or so minutes. Make sure you don't burn your garlic, always use medium heat. The shrimp are ready to serve. This is good for serving of four. Another tasty dish from my kitchen to yours !